The holidays are here and everyone has cookies on the brain. On Facebook, I recently asked what kind of cookie recipes you would like to see. Many of you requested thumbprints. Gluten free thumbprints to be exact. Well I hope you enjoy this recipe for Peanut Butter Chocolate Thumbprints. My husband said that these were the most delicious cookies I have made in a while. Of course he is a big fan of chocolate and peanut butter! 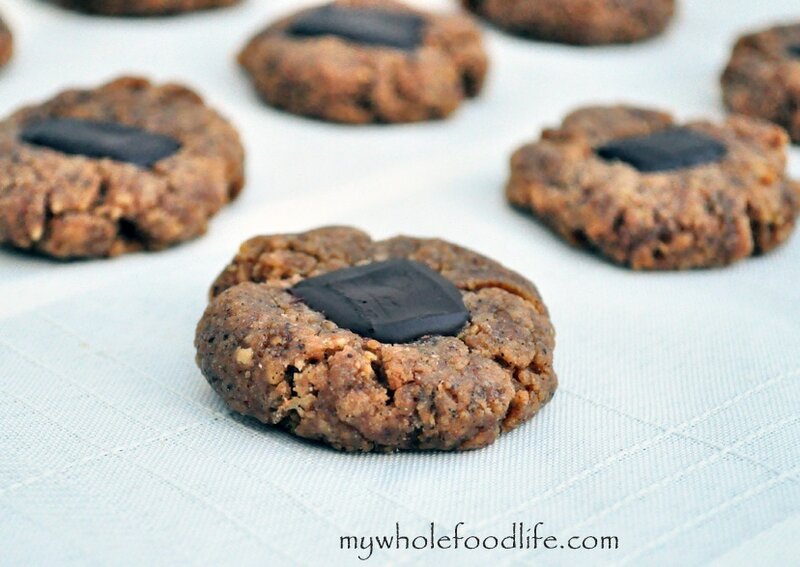 You can also make this recipe using almond butter or sunflower butter for a nut free option. Mix all the dry ingredients in a bowl and set aside . In a saucepan , on medium heat, combine the peanut butter, maple syrup, applesauce, coconut oil and milk. Add peanut butter mixture to a mixing bowl . Slowly add in the dry ingredients while mixing. You may need to add bit more milk if the dough looks dry. Roll dough into balls and place them onto a lined baking sheet . Using your palm, press each cookie flat. Using your thumb, press a little hole in the center of each cookie. Cut chocolate bar into small squares and press a piece of chocolate into the center of each cookie. Store cookies in the fridge so they last longer. They can also be frozen. These looks incredible. I am definitely adding these to my holiday cookie list! I actually like almond butter better. :) That would be delish! I have cookie party this weekend.... so excited to try this recipe!!!!! couple questions- How many cookies did you get out of this recipe and wondering if coconut sugar could be subbed for the sucanat? Yes it can cup for cup. I got 18 cookies out of my batch. I was wondering about how many calories were in your cookies. You're welcome! I hope you enjoy the cookies! I think garbanzo bean flour might work in place of the oat flour. What other ingredients do you need to replace? I made these today, and they are fantastic! I got 19 out of my batch, and they were 176 calories each, via MyFitnessPal.com analysis. I love that they are gluten-free and vegan! Oh yay! That's not too bad of a calorie count either considering they are pretty filling. Glad you liked the recipe! Wow...these are my new favorite cookie! I used coconut sugar and they turned out great. Thanks for the recipe! Glad you liked them Sandra! Awesome! I am so glad you enjoyed them! I was just thinking of trying these with cashew butter. Yummy!